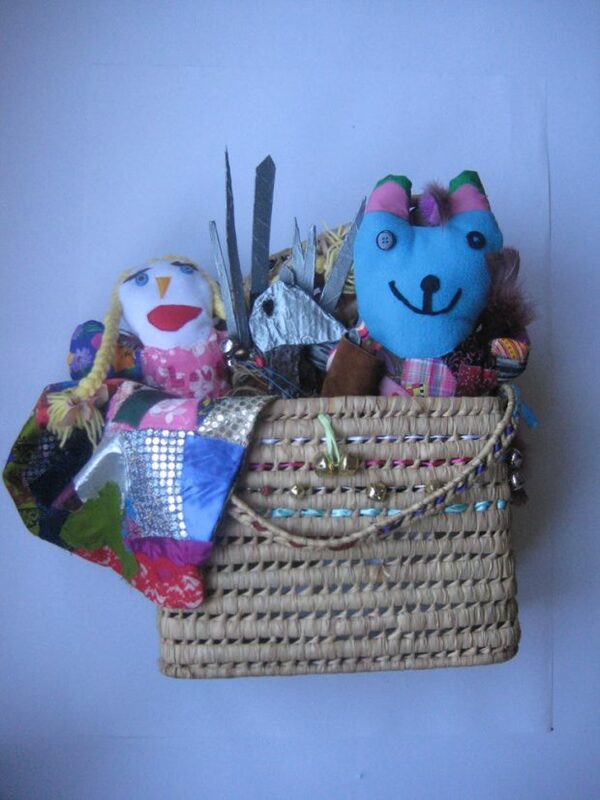 In February 2015, Carlisle Library launched its Seven Stories project working in collaboration with local Arts Group Prism Arts. The title ‘Seven stories’ reflects the number of participant groups: 3 schools, adults with mental health issues, adults recovering from a stroke, adults with a learning disability and dementia, and vulnerable older adults. The year long project consisted of a series of creative workshops which would produce a vessel from which stories would emerge taking people on a series of journeys to desert islands, castles, gardens, rainforests, space and the arctic. A time capsule and a re-creation of the Titanic’s fateful voyage were created using a replica of cloth made by Stead McAlpin of Carlisle who made the original that was used on the ship. We launched the project to tie in with National Libraries Day 2016 and invited many dignitaries to the opening, including the Chairman of the Council, who welcomed people to the event. On the day, we invited 30 children from the 3 local schools that were involved in the project. The proportion of disabled students and those who have special needs is well above average in these schools, as is the proportion of pupils known to be eligible for free school meals. Adult groups involved included people with a range of disabilities; severe learning disabilities, autism, blindness, memory loss, people living with the results of a stroke and people with dementia. Local arts group Prism Arts excelled in teaching students how to express themselves through the arts and worked alongside New Arts North to support arts and creativity in Penrith and Whitehaven. The project began with the students exploring the library, accompanied by an artist, to discover the mass knowledge, ideas and stories that are held within a library. The project did not relegate groups to sections of the library deemed to be appropriate for them, for example, older people working on local history, children in the children’s library. The groups were encouraged to discover the collection for themselves, finding the subjects, topics and stories that appealed to and challenged them. Each group then agreed on a story or theme and decided which type of vessel was most suitable to convey that theme. Throughout the year, the students were encouraged to use the library and engage in the arts, attending weekly craft making sessions in addition to working in schools and at Prism Art’s workshop. In November 2015, the library hosted the grand opening of the exhibition by Cllr Ian Stewart, Portfolio holder for Cumbria Libraries and Archives and John Stevenson MP. Students and adults had an opportunity to showcase a theatre and music performance to an invited audience. 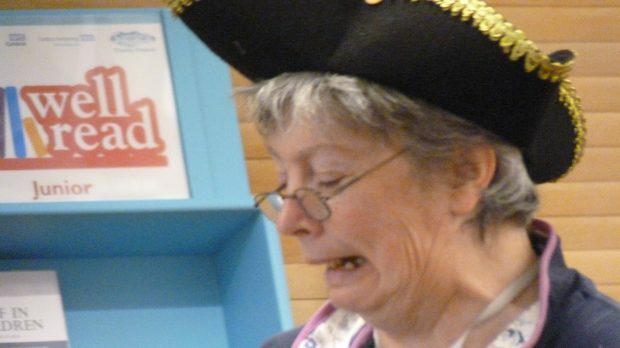 The exhibition consisted of a huge pirate ship, a message in a bottle and a re-creation of a 700 year old manuscript owned by and kept at Carlisle Library. The exhibition was followed by a performance by one of the local schools. A podcast was created recording the performance and featured on BBC Radio Cumbria. The children also recorded songs and wrote poems and stories as part of the exhibition which also feature on the Prism Arts Seven Stories website. 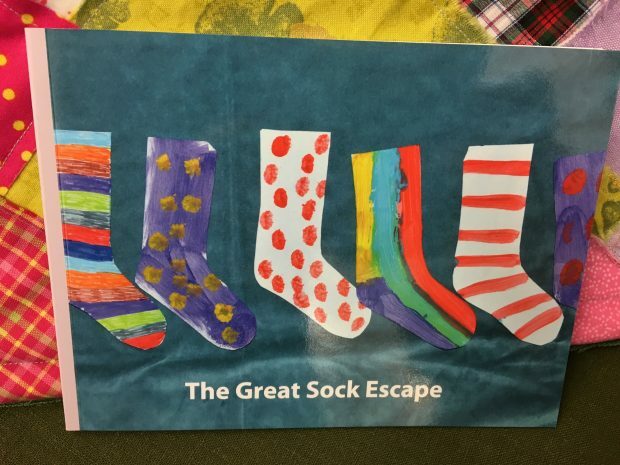 Two further exhibitions were created based on local area Talkin Tarn and The Great Sock Escape to Sock Mountain. Postcards and books, like the one below, were created using the graphics taken from the exhibition. Our library users commented on the fantastic array of colourful fabrics and materials that adorned the frame hanging from the ceiling in the centre of the library. We attracted many new visitors following coverage in the local newspaper, a broadcast on BBC Radio Cumbria and from our Facebook and Twitter pages. The feedback from the participants is heart-warming. One lady who suffered a stroke 3 years ago and had to give up her job as a result of this, said ‘working on this was something to do to fill up the hours; the days are long when you are on your own. I try my best to get out and do things, it’s good for the mind and I look forward to working with art every week’. We are happy to report that we achieved all of our objectives and, at the same time, gave so many people the opportunity to be inspired and engage in reading and creativity. They are able to think differently now about what our library has to offer by way of a vibrant community space full of colour, inspiration and creativity! Finally, we accredited 90 young people with Arts Awards. The Seven Stories project has raised the profile of our service through the media, with Councillors and our local Member of Parliament. The result is a vibrant and community focussed library exhibiting work created and viewed by the local community. Our thanks go to Prism Arts, the Arts Council and all the artists and participants who have created an exhibition inspired by the library itself and the books on its shelves. To keep up to date with activities in Cumbria Libraries, follow them on twitter.